For many companies, a silent blog means either that they don’t really understand online media, or that they are just focused on the core business which is mostly offline, or that they are about to go bust. None of those things are true for Small Pictures. Most of our business is online and what is more, it’s thriving. Considering that blogging is one of the things we do best, this company blog has been shamefully neglected. It’s just we’ve all been terribly busy, so bear with us while we play catch up. In the past few months, we’ve devised and launched quite a few successful additions for our illustrious client John Cleese, as he attempts to rake in as much money as possible to assist with his alimony payments. Here’s what we’ve been doing, in brief. The shirt promptly started to sell and has continued to sell ever since. This is real time web meets real time retail – you read it here first. We’re so contemporary it physically hurts. 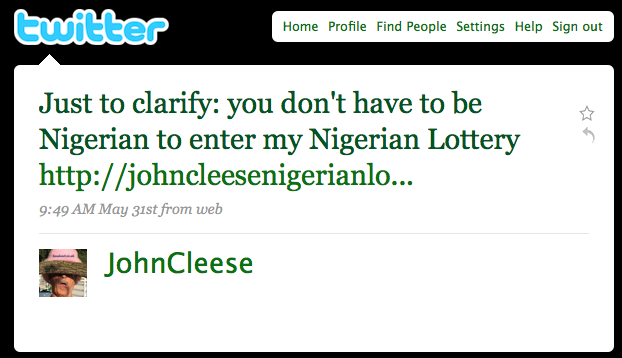 John Cleese’s Nigerian Lottery – aka the email newsletter has also been a great success. We took over the old list, cleaned it up, gained 5,000 new addresses from the 270,000+ Twitter followers and continued banging out fun monthly missives. It’s a blatant, opt-in third party marketing ploy, and though we’ve been gentle so far and sold official t-shirts and advertised John’s tour dates, obviously we’re prepared to include ads for other people for a reasonably high price, as long as they are sufficiently amusing. So, contact us by leaving a comment here if you have a product or service you’d like us to shill to John Cleese’s most fawning fans. Really, we’ll consider anything legal. Facebook finally changed its Terms and Conditions so that they didn’t lay claim to your first born child and your pension, which meant we could begin to use that sprawling social network. We picked up the unofficial fan page http://bit.ly/cleesebook from a kind and generous fan, authenticated it, and we’ve added 20,000 new members in a little over a month. We’ve some other cunning plans in the pipeline, including mobile activity (iPhone, Android) in the months to come. If you really want to keep up to date with our Cleese activities, you’re better off following John’s Twitter account though, than subscribing to this blog, which given the huge investment of time and energy we put into our day to day work will only occasionally get a look in. The only reason I’m writing this now is because the weather is so dreadful, I’m stuck in on a Saturday night. 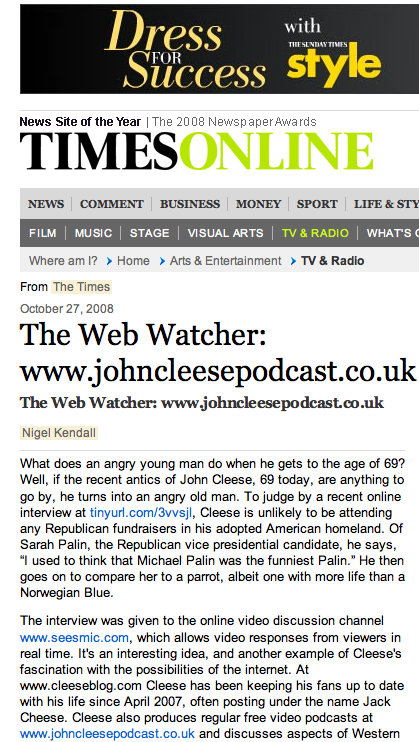 We’ve been busy working on producing John Cleese’s new videos, to be released via his Headcast website on June 7th 2009, and also the internet campaign which surrounds the launch. As well as video production which includes animation, music composition, sound and graphic design, our work also includes a new shop featuring authorised merchandise, World of Cheese, and a revamped email list, dubbed the John Cleese Nigerian Lottery which as John points out on Twitter, you don’t have to be Nigerian to enter. John Cleese’s fondness for the written word means that he tends to value diligently prepared scripts – as Eric Idle tells here. So it’s nice that John is starting to use video in this more intimate spontaneous way, with the able assistance of Garry Scott-Irvine whose numerous organisational tasks now extend to cameraman. Therein lies a tale of mastering the short form and being prepared to chase chickens in your pyjamas. This kind of video is perfect for video blogs (or “vlogs”). Small Pictures maintains John’s blog at Cleeseblog.com. Using Vimeo as well as old-school podcasting (downloads delivered by RSS, available in iTunes and other podcast aggregators) also means that people can view the video in very good quality without necessarily being able embed in other sites, or download and re-post against the wishes of the client. Vimeo’s PLUS (pro) option gives great control over functionality and permissions of online video, and also allows HD to play on remote sites, for a price. Small Pictures completed this short video for Forsters agency which was delivered as a downloadable video podcast, streaming flash and DVD, for NHS Southampton Alcohol Units Awareness Week. LeWeb 08, Paris – the major annual international internet conference on European soil, attempting to be a beacon of hope in the wreckage of a stalled economy, costing 1m euro to stage, presenting a host of international names, A-list sponsors, a start up competition, demo rooms, after-show parties and visits from a famous author and a French government minister. Day one was a struggle in many respects. The assembled had no internet, no WiFi, and the strain was palpable, as online presentations ground to a rusty halt. There were glazed expressions on many faces at the end of the first morning, the geeks clinging tightly to their mobile devices, retaining their precious, flickering connections to the promised land. To make matters worse, the heating failed and people shivered in the vast conference hall. Still, there was coffee, breakfast pastries, and lunch, although the portions were small, as were the tables. The desperate throng had literally to be held back from the food by presence of sharp-eyed caterers and the looming glare of security guards until the allotted time of 1.30pm. Accompanied by a Franco-Mexican trio, it was a truly surreal feeding frenzy. Blood was in the water, and those higher thinking functions – internet, code, commerce – counted for nothing in the lust for nutrition. This for me was the most riveting spectacle – geek sharks battling for sustenance. Day one, I ate, and day two, I shot video. Vinvin from Seesmic enjoys a tour of John’s Californian cottage. Produced by Vinvin, Garry Scott-Irvine and Dean Whitbread. Watch this in HD on Vimeo. This was a rather nice job taken on at short notice – producing a video of a short poem by Bréon Rydell, on chilly but sunny Westminster bridge. Nice coverage of our recent online video work with John Cleese and Seesmic from Nigel Kendall at the Times – does coverage from the Guardian, the Telegraph and the Times constitute a full house? One of the great comedy clichés is that the secret is in the timing, and Cleese is a master. Ponder, for instance, his timing of a recent series of commercials for Kaupthing (tinyurl.com/6fecxu). It’s the biggest company in Iceland, he tells us. Not any more it isn’t. Kaupthing was one of the biggest casualties of the recent global banking collapse. We can only hope that Cleese’s similar commercial for the Polish bank BZ WBK Commercial, at tinyurl.com/5khe4h, was more successful. As he heads into his eighth decade, he’s clearly planning for the medical attention he may need by his ninth. Happy birthday, Mr Cheese. He’s from Santa Barbara via Weston-super-Mare, you know.